Rue Morgue’s CineMacabre Movie Nights promise the best of classic and contemporary horror at The Royal Cinema – once a month, every month! Straight out of Nancy Reagan’s “Just Say No” anti-drug era in the ’80s, Frank Henenlotter penned his own take on the sobriety situation: a neon-coloured, goopy little horror-comedy called BRAIN DAMAGE. It follows Brian (Rick Herbst), a young man who wakes up in a psychedelic ecstasy, all because of a small creature named Aylmer that has attached itself to his brainstem. Soon enough he becomes viciously addicted to the euphoric state that Aylmer provides, and is at the complete whim of his new phallic-shaped friend. What follows is a gritty, darkly comic, and ultimately off-the-wall bizarre analogy for addiction, embodied by Brian’s relationship with Aylmer, a little crooner-voiced purple and blue monster. Pushing body-horror, humour and the climate of the time to the weirdest limits possible, Henenlotter’s BRAIN DAMAGEis a time-tested cult classic. Where “just say no” permeated pop culture in the ’80s in after-school specials and anti-drug campaigns, Henenlotter chose to take the idea and bring it to a level of sheer pornographic absurdity. 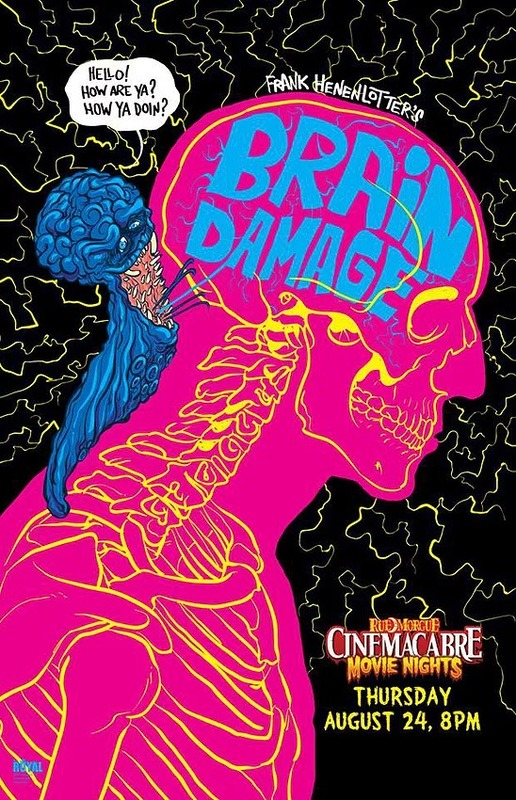 BRAIN DAMAGEremains a staple horror viewing that must be seen on the big screen – but is definitely not for the squeamish.